Mariette has qualified direct to the finals for a second time with her folksy pop song "A Million Years" and has been spending much of the time off between the semi-final and final resting up and recovering, having caught a cold during the time. 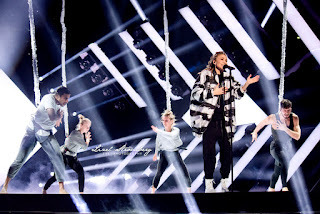 Despite the lack of substantial time to rehearse, she remains confident in the overall vision and presentation of the song, with the dancers flying through the air on bungee chords. She has found some symbolism to tie the visuals in with the song that she co-wrote herself. "When we got to Malmö and I saw these bungee jump chords, I thought, this is the [symbolism] between the bungee jump chords and the message of the song, that we're all connected and those bonds between people. If there's just enough love, you will always come together." Mariette began her musical journey at home by playing on her father's guitar and singing at family get-togethers. "I was standing behind a door, singing, cause I was so shy." She also wanted to turn the lights off so she could perform without being seen. This led to her starting some bands, one of them being with her brother in which they played Nirvana and Green Day songs. She went to a music school to play guitar and continued to play live shows, learning to mix and record music along the way. She even started her own record label in 2007 which she used to put out her first album and still has it despite being signed to Warner Music Sweden. Mariette has been writing and recording plenty of music all throughout 2016 and aspires to accumulate enough content to eventually release an EP or full album. She takes a hands-on approach to putting together ideas for visuals to accompany the message of the songs that she writes.